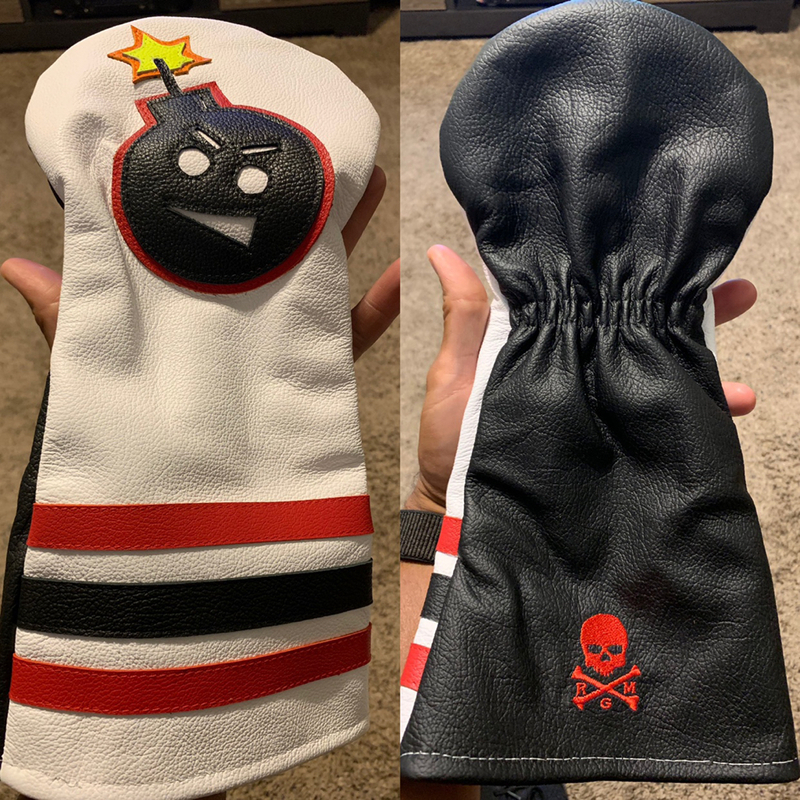 Anyone else purchased RMG headcovers? I bought some back in early 2014. The leather is very high quality and the inside of the cover is a very soft plush material. I'm very happy with mine. The shield with old english one and the diamond with anchor stencils were actually my idea I'm proud to say. Robert normally charges for new stencil designs if it's something he doesn't already have, but he did not charge me in this case as he wanted to use them as one of his new stencil designs. He featured them on his Facebook page at the time as well. If you want to see pictures of his work just check him out on Facebook. There are hundreds of pictures on there. He has some pretty cool designs. Look very well made but not something I would buy. I haven't bought any headcovers from him but did buy a scorecard/yardage book holder and to was done well. I purchased one from him and have been very happy with it. I bought one from a seller on Etsy that is more rigid and holds its shape better that I have been using but used the Robert Mark one for a year or so. he did a phenomenal job with my putter headcover. I could not be happier. but the d/fw/h covers are terrible. the quality is there, but we communicated very poorly, and even after the re-do I still hate them. sketch exactly what you want, and ask him to send a drawing back just to make sure everyone is saying the same thing. This thing showed up today and I’m impressed with the quality! Just like my putter cover!! We're basically besties at this point. Haha, it was the only one that really stood out to me! I had him do the back in black instead of the red pictured in the site and it turned out great. @cbaker2882 alright big dog, spill the beans. This is what I am having made by Rob. The MySpider I have is green with white, and the cover should match the theme for the Bobcats really nicely (sorry Dan). Inside I went with the black fuzzy lining he does. Can’t wait to see it done! I dig it dude. The quality you’ll get when in hand is IME unsurpassed. haha dude, it's not my fault you went to the wrong school! I have a feeling that cover is going to blow your mind when you get it in hand. Do you mind if i ask what the price was, and whether you can apply discounts to custom covers?